Jupiter's ocean-harboring moon Europa, as seen by NASA's Galileo spacecraft. MOFFETT FIELD, Calif. — Government agencies may not have a monopoly on life-hunting space missions for much longer. Breakthrough Initiatives, which already scans the heavens for possible signals from faraway alien civilizations, is considering looking for E.T. on worlds close to home, founder Yuri Milner said. Milner, a billionaire tech investor, founded Breakthrough Initiatives in 2015 with his wife, Julia. The organization already funds the $100 million Breakthrough Listen project, which is hunting for pings from intelligent aliens, and the $100 million Breakthrough Starshot effort, which aims to develop tiny laser-sailing spacecraft for the exploration of nearby exoplanetary systems. "But we can take more risk," Milner said. So, where might this putative Breakthrough mission go? 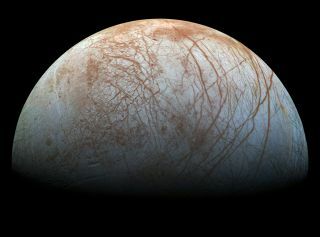 Milner cited as possibilities Jupiter's moon Europa and the Saturn satellite Enceladus, both of which have oceans of liquid water beneath their icy shells, as well as Venus. Venus may seem like an odd choice, given that its surface is bone-dry and hot enough to melt lead. But conditions in the clouds, about 25 miles (40 kilometers) up, are much more life-friendly, Milner noted. Milner also mentioned Mars as a potential abode for life, but he said the Red Planet is a less "realistic" Breakthrough target. "On Mars, you probably have to go deep underground, many people believe — probably meters, if not dozens of meters, to see something potentially interesting," Milner said. "And Mars, most of the experts agree that if you find something, it will most likely be some historical artifacts of life, rather than a living organism. But you never know." Enceladus' inclusion on the list shouldn't come as a big surprise. Last November, Milner said that Breakthrough Initiatives was investigating the feasibility of launching a probe that would look for signs of life in the plume of water vapor and other material wafting from Enceladus' south polar region. This stuff comes from the 313-mile-wide (504 kilometers) moon's buried ocean, scientists say. Sunday's ceremony honored winners of the Breakthrough Prize, which is given out every year for ground-breaking research in physics, mathematics and life sciences. Seven $3 million awards — the richest in science — were given out this year, along with a handful of other prizes, which brought the total purse to $22 million.